F and T started care with me in the first trimester of their first pregnancy. F had a great pregnancy. As her due date neared, her baby liked staying in a ROT (right occiput transverse) position despite doing position exercises. On the evening of November 18, I saw F for her 41 week appointment and her sweet boy got the right idea and had rotated into an LOA (left occiput anterior) position, which is the most ideal position for labor. I knew birthing time was near! Around 9am on November 21st, F sent me a text saying she had been having some irregular contractions since 1am that were getting stronger, as well as some leaking that began at 7am. I asked F to come in so I could confirm what was going on with the leaking. F arrived with her doula J at 1030am. She was 5cm dilated, 100% effaced and baby was at a -1 station with a bulgy bag of water. F had cervical scar tissue that was still present. She allowed me to massage on it and it broke up on my fingers with a contraction. I reviewed with F when I would come and recommended she go for a walk when she got back home. J sent me a text at 11:32am letting me know that F’s water broke. Contractions seemed strong and regular and they thought I should come soon. I arrived at 12:20pm, and got settled with initial vitals. F went out for a walk with her doula, then came back in and did open knee chest in her body, snuggling with M. She was so calm and poised, it made it hard to time contractions. I did an exam at 2:25pm and found F to be 6-7cm dilated, 100% effaced and baby at a -1 station. I felt some molding on the baby’s head. I suggested for F to try the abdominal lift and tuck with the rebozo for ten contractions. J got her rebozo and did them with her. During that time, it seemed that contractions were 2-4 minutes apart, lasting 60 seconds long. J did a sacral release with F and had her twerk through a few contractions. F felt like contractions were strengthening and that the rectal pressure was building. She got into the pool at 5:20pm, laboring on her knees. The warm water took the edge off, and F gently moaned with labor waves. She began to alternate between semi reclining and kneeling based on what her body was telling her to do. She began to feel nauseated and we quickly had the peppermint oil out to help. Contractions were coming every 3 minutes, lasting 75 seconds. F said everything was hurting. She asked for an exam. 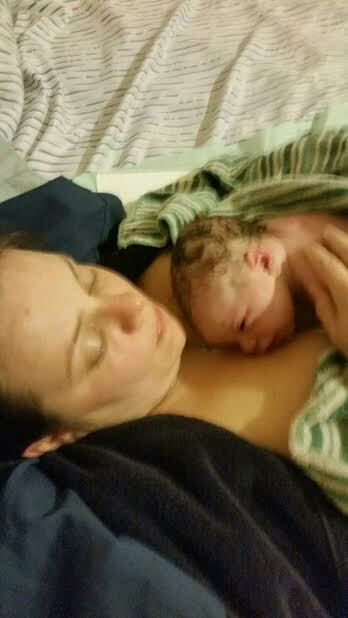 She was 8cm dilated, 100% effaced and baby at +1 station at 6:39pm. However, her cervix was starting to swell. I recommended she get out of the pool and get in an open knee position for 40 minutes to help the swelling. F struggled with the position so she moved to her left side in the bed. I did another exam at 7:20pm so I could get a better feel since she was in the bed and see how we can help since the knee chest was too hard. I decided she felt more like 7cm, 100% effaced and a 0 station in the bed. F gave open knee chest another go for a few minutes, before getting up and walking around the house. I suggested trying the lift and tuck again but she didn’t want to try it. F moved to the floor, feeling emotional. I gave her a tincture to help calm her nerves, and M gave her a tincture to give her some energy. J suggested calling a chiro in, which I thought was a fabulous idea. The chiro arrived right before 9pm. I truly believe this was a huge game changer for the labor! The chiro adjusted her, then had F walk around and see how she felt. Contractions seemed stronger, and the chiro headed out. The pool was warmed up. F was so ready for the relief of the warm water. F got into the pool at 9:20pm, alternating laboring on her knees and sitting. Contractions were coming every 2-2.5 minutes, lasting 90 seconds long. F labored so beautifully. She alternated her position as her body told her, moaning low to bring her baby down. At 10:22, she stated she felt that she was sitting on the baby’s head, he felt so low. As the hour came to an end, F began to spontaneously grunt at the peaks of the contractions.She began to spontaneously push at 11:00pm. I found she had a lip of cervix left a few minutes later. F wanted to try to work through it by blowing versus me holding it back. It wasn’t working well as the urge was strong. F agreed to me trying to hold the lip back at 11:31pm, but the discomfort was too much and F decided to try longer pushes on her own to see if she could push past the lip. F did such a beautiful job, and dug deep to find the strength to give the long, hard pushes. As midnight neared, F exclaimed to us all that he was right there. I gave a feel and found some of the head sitting on the perineum. A couple more pushes and F brought her baby’s head to crowning. The head was birthed two minutes later at 12:05am. He had a nuchal arm that emerged with the head. The other arm seemed to get a little stuck under the pubic bone that I gently helped nudge out, and then he flew out into my waiting hands and brought right to his mama’s chest. He needed a few puffs to get the right idea about breathing, but was soon crying for all to hear. He was finally here! Welcome to the world Thomas, born on November 22, 2016 at 12:06am, weighing in at 7lb6oz, 19″ long. His mama worked so very hard to bring her baby earthside the way she wanted. Take a look at this placenta. The body is amazing, and what a blessing that F’s body so perfectly grew this sweet boy with this placenta. F was strong and amazing through out her journey. It was such a pleasure to serve this fun family as they went from a family of two to a family of three.